The Supreme Court decided in favor of Westboro Baptist Church March 2 in a case that is very controversial, like most things in which the self-proclaimed church is involved. The church is notorious for causing a disturbance at funerals of soldiers that were killed in combat. They attend the funerals to protest and claim that this is God’s way of punishing the country for its acceptance of homosexuality. Now, church leaders of Westboro have threatened to protest at the funerals of children who died recently in a Perry County fire. Lance Corporal Matthew Snyder died while fighting in Iraq. Members of Westboro found out about the funeral and came to protest. Albert Snyder, the father of the deceased, decided to press charges against the church. Initially, the father was awarded $10.9 million. Then on February 4, 2008, that total was reduced to $5 million. Westboro appealed the case, and the Fourth Circuit Court of Appeals reversed the lower court’s decision. Then the Supreme Court decided to take the case. Although the Supreme Court has sided in favor of Westboro Baptist Church's protests, not everyone agrees. Cartoon courtesy of Politically Illustrated. This decision surprised many. It was a lopsided decision of 8-1 in favor of Westboro Baptist Church. Chief Justice Roberts, who wrote the majority opinion, stated all of Westboro’s actions were protected under the First Amendment. Ben Baer, a senior, agreed with the decision. He feels that as long as the church follows all the rules that they aren’t doing anything wrong. “They should be allowed to voice their opinion,” said Baer. Westboro Baptist Church has strong beliefs against homosexuality, and believes that all tragedies that happen are because of America’s tolerance of homosexuality. Fred Phelps is the leader of the church, which consists mostly of family members. Justice Samuel Alito wrote the dissenting opinion. He believes that the Church was only protesting to bring attention to themselves. He also went on to say that there were many other places Westboro Baptist Church could have picketed, but they chose not to because the protest would have probably gone unnoticed. Tyler Keck, another senior, said he agrees with the opinion of Alito. “There were plenty of public places for them to protest, there is no reason they had to be at a funeral,” said Keck. Keck also believed that because Westboro personally attacked the family that they should not be protected under the First Amendment. No one thought the tragic deaths of seven children in a house fire in Perry County had anything to do with the Westboro Baptist Church. However church leaders issued a statement announcing they would be holding a protest at the funerals of the children to show the fire was the result of God’s wrath on the homosexuality issue. The U.S. Senator from Pa., Robert Casey, issued a statement denouncing the planned protest at the childrens’ funeral. Any group that protest at soldiers funerals, no matter what there sexuality is despicable. Yes I know we have the First Amendment there to protect freedom of speech but this should be an exception. There is no need for protesters to be there. A funeral should be a time of mourning, reflection, and a celebration of the life that the deceased person had lived. Now recently they planned on protesting at a funeral for children that died in a fire? Yeah don’t even get me started with that. Anyone that protests at a soldiers funeral is messed up but at the same time accepting homosexuals is disgusting because it is not natural! I think that protesting a funeral of a soldier that helps to protect the rights they hide behind in the lawsuit is disgusting. Without fighting men and women of heterosexuality or homosexuality our nation wouldn’t have any rights. A homosexual service member deserve the same right to rest in peace as a straight soldier gets. First off I think that is so hypercritical to be discriminating against the rights of our people in america ………there would be no AMERICA if there wasnt no freedom, freedom of speech, freedom of religion , freedom of sexuality and so on and so forth…….you know what I am talking about, REGARDLESS of the first amendment its still wrong!!!!!!! Its automatically discriminating against the rights of homosexuality(Freedom is AMERICA)you go against gods will of Thou shall take you as thy come,,,,,so don’t even try it!!!!! God will love everyone just the way they are……… and you come with this BS!!!!! Believe it or not Gays will be accepted in thy kingdom because of the hate you bring upon them. Oh by the way I’m a straight person defending the rights of freedom regardless of sexuality ” Its hate that brings this world to so much pity and its people like you(PROTESTERS) who deal the devils work! Amongst all of our people you decide you can judge Ha….well guess again people because you know the lord is watching and in the end you will be judged for what you have done and hated so much:( ashame on AMERICA, sad to say but we are all children of god and for you to wish death among your brother you have yet to seen the end …I pray you live forever>>>I SUPPORT GAYS ALL THE WAY !!! !Copy it Paste it ….report it thats what your good at! May God bless you and open your eyes to the truth. oooookkkkkayyyyy: You’re a complete idiot. You’re as ignorant as this stupid church. Ryan: couldn’t have said it any better myself! As a born again believer and a follower of Jesus Christ I would like all people to know that these people are not true christians but a hate group. The bible clearly speak of them as wolfs dressed in sheep clothing. Jesus said ” By their fruits you shall know if they are trully my followers.” This group show no love in the heart and love is the foundation of Christ bearing fruit…. Those westboro punks are despicable! I’m all for freedom of speech and the right to protest, but this case shouldn’t be considered a freedom of speech case. The Westboro Baptist Church had no right to invade this family’s, or any others previous, because they believe that homosexuals aren’t considered people. This case should have been judged on common sense. If it was, Albert Snyder would have received the money he deserves because it is truly common sense. Any one with common sense, obviously excluding the Westboro Baptist Church, would have sided Snyder. Ben Baer is Wrong! I totally agree with Zach. It shouldn’t matter if a soldier is heterosexual or homosexual, their funeral should be a period of private reflection to celebrate a life lost…not a chance to protest against their sexuality. And btw, Matthew Snyder was a heterosexual soldier. He had absolutely nothing to do with the intentions of Westboro. As much as I understand the Supreme Court’s rationality and implementation of the First Amendment, I think the decision seriously crosses the line between what is morally correct and what is Constitutionally correct. If you made an exception for one thing than you would slowly take away the rights that every person has to protest. 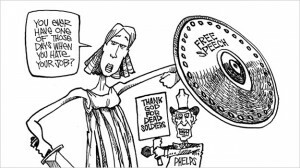 In order to ensure that the right to free speech is not we must allow people to hold peaceful protests when ever they want to, and not persecute some one just because they have an unpopular view point. Also if you have seen the video of the bikers talking about exercising there second amendment rights at the funeral i would personal sue every single on of them for terrorist threats. That kind of behavior is deeming to our society as a whole and should not be tolerated. Also they did not personally attack the individual family members they were protesting the whole military and Americas tolerance of homosexuality. 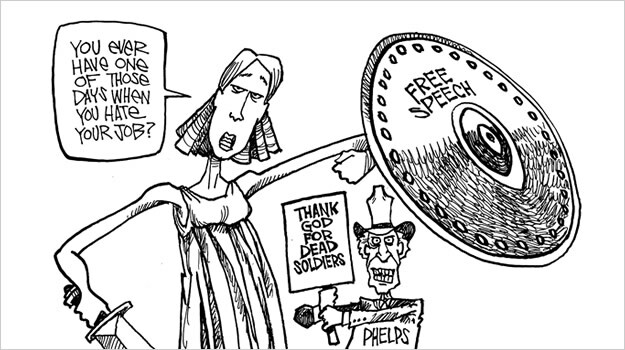 There is a line that i believe they crossed between free speech and hate speech. The only reason they chose to protest that funeral was because the soldier was homosexual! Imagine if it were your child that was being buried. Wouldn’t you want a peaceful ceremony? Try to put yourself in the families place. I believe Westboro Baptist Church is the greatest church ever. Do not question the intentions of God. And what makes being gay so wrong? If god himself believes that gays aren’t people because of their sexuality, that’s fine. As long as you can prove it. If some one would show me physical proof that god himself, in the flesh has written down, Gays aren’t people, please, by all means, I want to see it. If you can’t show me, well too bad, I guess we know who right. Obviously not the Westboro Baptist Church. Although it isn’t mentioned in the article, the soldier that the funeral was held for wasn’t gay, they simply protested there for the sake of publicity. Westboro followers need to be put in prison.